Exclude the costs of child and elder care from tax. In a world where almost two-thirds of mothers with children under age 6 are employed, the cost of child care is an unavoidable family expense. In business, other such expenditures are tax-deductible, but they are not for families. The Trump plan will exclude child care costs from the income tax from birth to age 13 and will include adoptive parents as well as foster parents who are legal guardians of the child. The exclusion (also known as an above-the-line deduction) will cover up to four children per family. The exclusion would apply to a variety of different kinds of child care — institutional, private, nursery school, after-school care and enrichment activities. The deduction would be limited to the average cost of child care in the state of residence for the age of the child. The benefit would be provided to families who use stay-at-home parents or grandparents as well as those who use paid caregivers. Similarly, the Trump plan would allow an above-the-line deduction for elder care costs necessary to keep a family member working outside the home. It would apply to costs like home care or adult day care for elderly dependents when those expenses are needed to keeping family members in the workforce. The deduction would be limited to $5,000 per year. To get benefits to lower-income taxpayers who can’t use the exclusion against the income tax because they have no income tax liability, the Trump plan would provide them a boost in the Earned Income Tax Credit (EITC). This boost would be half of the payroll taxes paid by the lower earning parent, and would be subject to an income limitation of $31,200. Allowing every family, whether they take the standard or itemized deduction, to deduct child care expenses from tax will help get the incentives right for women who opt to work outside the home. The current tax code discourages their work. Create child care savings accounts. Families should have an option to set aside extra money to foster their child’s development. The Trump plan will provide Americans the option of opening dependent care savings accounts (DCSAs). Annual contributions and earnings on the account will not be subject to tax. Immediate family members and employers also will be able to set aside funds in these accounts, which will be established for the benefit of specific individuals, including unborn children. Total contributions could not exceed $2,000 per year from all sources, but balances in a DCSA will roll over from year to year so that substantial amounts could be accumulated over time. When established for a child, parents can use the accumulated funds to enroll their kids in a school of their choice or for other enrichment activities that prepare them for their future. Funds remaining in the account when the child reaches 18 can be used for higher education expenses. To encourage low-income families to establish DCSAs for their children, the government will provide a 50 percent match on parental contributions of up to $1,000 per year. That’s an extra $500 per child for families that qualify. When established for an elderly dependent, the funds can be used for adult day care, in-home or long-term care services. The ability to set aside funds tax-free would be particularly helpful to women, low-income workers and minorities, who typically are primary care providers who reduce paid time worked in order to provide care. The ability to set aside funds for elder care is critical because taking time off from work to care for elderly family members reduces a woman’s financial readiness for retirement, and can increase a woman’s risk of living in poverty in old age. Create a dynamic market for family-based and community-based solutions. Families will be given the power and information to choose who will provide care and where that care will be provided without fear of loss of government benefits. The marketplace will be free to develop alternatives that provide care where needed, and at the times when people who work irregular hours need care. Current federal efforts to reduce child care costs, such as the pre-tax flexible spending accounts available to many workers, are biased toward center-based care. The lack of choice limits options for people who work irregular hours and those who live in rural communities where choices for center-based care are not available nearby. Incentivize employers to provide child care at the workplace. The 2014 National Survey of Employers found that only 7 percent of employers offered child care at or near the worksite. The Trump plan will make the existing tax credit for employer-based child care facilities more effective, and will allow the same income tax exclusion allowed to individuals to businesses that contribute to an employees’ cost of child care. Legislation enacted in 2001 included a bipartisan incentive for on-site child care. That law gave companies that provide appropriately-licensed on-site child care centers a tax credit of up to 25 percent of facility expenditures, plus 10 percent of resource and referral costs, up to a limit of $150,000 per calendar year; a portion of the credit is recaptured if the center is kept in service for less than 10 tax years. The Trump plan would increase the cap, shorten the recapture period, and devise ways for companies to pool resources in order to make the credit more attractive. Because breakdowns in employee child care networks of care cost U.S. businesses $4.4 billion annually as a consequence of avoidable employee absenteeism, both businesses and families will benefit from the increased availability of convenient, reliable care. Such facilities also could provide back-up or emergency care for employees with family-based or in-home care. Further, allowing businesses the same exclusion from income for their contributions to their employees’ child care will give businesses the opportunity to provide a benefit that helps their employees remain in the workforce. This may be particularly attractive to small businesses that are unable to provide worksite care and take full advantage of the tax credit for on-site child care centers. Provide six weeks of maternity leave to new mothers. The Trump plan will enhance Unemployment Insurance (UI) to include six weeks of paid leave for new mothers so that they can take time off of work after having a baby. This would triple the average two weeks of paid leave received by new mothers. Providing a temporary unemployment benefit for eight weeks through the UI system would cost $2.5 billion annually at an average benefit of $300 per week. This cost could be offset through changes in the existing UI system, such as by reducing the $5.6 billion per year in improper payments or implementing the proposals included in the administration’s FY 2017 budget regarding program integrity. Providing the benefit through UI — paid for through program savings — will not be financially onerous to small businesses when compared with mandating paid leave. An analysis of a similar program in California has shown that unmarried, nonwhite and non-college-educated mothers receive the most benefit. The Trump plan promotes economic freedom for women. Many women stop paid work to provide care because other options are not readily available. This often limits their careers, and is fundamental to the wage disparities that women face. In 2014, single women without children made 94 cents on a man’s dollar, but married mothers with children younger than 18 made only 81 cents. A one-size-fits-all solution ignores the reality of today’s modern family dynamics. It is essential to empower women who choose to work outside the home to do so, without penalty, while also supporting women who choose to work inside the home. Simplify taxes for everyone and streamline deductions. Lower taxes for everyone, making raising a family more affordable for working families. Reduce dramatically the income tax. We will simplify the income tax from seven brackets to three. Exclude child care expenses from taxation. Limit taxation of business income to 15% for every business. Make our corporate tax globally competitive and the United States the most attractive place to invest in the world. For every one percentage point of slower growth in a given year, that’s 1 million fewer jobs for American workers. Reducing taxes on our workers and businesses means that our workers can sell their products more cheaply here and around the world – meaning more factories, more hiring and higher wages. A temporary pause on new regulations and a review of previous regulations to see which need to be scrapped. Require each federal agency to prepare a list of all of the regulations they impose on American business, and rank them from most critical to health and safety to least critical. Least critical regulations will receive priority consideration for repeal. Hire experts who know how to create jobs. The Environmental Protection Agency’s Clean Power Plan, which forces investment in renewable energy at the expense of coal and natural gas, raising electricity rates. The EPA’s Waters of the United States rule, which gives the EPA the ability to regulate the smallest streams on private land, limiting land use. Excessive regulation is costing our country up to $2 trillion a year, and we will end it. Appoint trade negotiators whose goals will be to narrow our trade deficit, increase domestic production and get a fair deal for our workers. Withdraw from the Trans-Pacific Partnership. Our trade deficit in goods is almost $800 billion on an annual basis. The trade deficit subtracts from growth and costs the U.S. jobs. Rescind the Climate Action Plan and the Waters of the U.S. rule. Lift restrictions on American energy. Energy costs the average American households $5,000 per year. As a percentage of income, the cost is greater for lower-income families. An America First Energy Plan will bring down residential and transportation energy costs, leaving more money for American families as they pay less each month on power bills and gasoline for cars. This also will make electricity more affordable for U.S. manufacturers. Other reforms, to be rolled out in the near future. Child care is the single greatest expense for most American families — even exceeding the cost of housing in much of the country. Trump will allow families to exclude child care costs from income. On day one promulgate a “proposed rule” (regulation) to redefine applicable financial institutions to include money transfer companies like Western Union, and redefine “account” to include wire transfers. Also include in the proposed rule a requirement that no alien may wire money outside of the United States unless the alien first provides a document establishing his lawful presence in the United States. On day two Mexico will immediately protest. They receive about $24 billion a year in remittances from Mexican nationals working in the United States. The majority of that amount comes from illegal aliens. It serves as de facto welfare for poor families in Mexico. There is no significant social safety net provided by the state in Mexico. On day three tell Mexico that if the Mexican government will contribute the funds needed to the United States to pay for the wall, the Trump administration will not promulgate the final rule, and the regulation will not go into effect. Trade tariffs, or enforcement of existing trade rules: There is no doubt that Mexico is engaging in unfair subsidy behavior that has eliminated thousands of U.S. jobs, and which we are obligated to respond to; the impact of any tariffs on the price imports will be more than offset by the economic and income gains of increased production in the United States, in addition to revenue from any tariffs themselves. Mexico needs access to our markets much more than the reverse, so we have all the leverage and will win the negotiation. Cancelling visas: Immigration is a privilege, not a right. Mexico is dependent on the United States as a release valve for its own poverty – our approvals of hundreds of thousands of visas to their nationals every year is one of our greatest leverage points. We also have leverage through business and tourist visas for important people in the Mexican economy. Keep in mind, the United States has already taken in four times more migrants than any other country on planet Earth, producing lower wages and higher unemployment for our own citizens and recent migrants. Visa fees: Even a small increase in visa fees would pay for the wall. This includes fees on border crossing cards, of which more than 1 million are issued a year. The border-crossing card is one of the greatest sources of illegal immigration into the United States, via overstays. Mexico also is the largest recipient of U.S. green cards, which confer a path to U.S. citizenship. Again, we have the leverage so Mexico will back down. Mexican gangs, drug traffickers and cartels have freely exploited our open borders and committed vast numbers of crimes inside the United States. The United States has borne the daily cost of this criminal activity, including the cost of trials and incarcerations. Not to mention the even greater human cost. We have the moral high ground here, and all the leverage. Make Mexico pay for the wall. The cost of building a permanent border wall pales in comparison to what American taxpayers spend every year on the fallout of illegal immigration on their communities, schools and unemployment offices. Mexico must pay for the wall and, until they do, the United States will, among other things, impound all remittance payments derived from illegal wages; increase fees on all temporary visas issued to Mexican CEOs and diplomats (and if necessary cancel them); increase fees on all border crossing cards – of which we issue about 1 million to Mexican nationals each year (a major source of visa overstays); increase fees on all NAFTA worker visas from Mexico (another major source of overstays); and increase fees at ports of entry to the United States from Mexico (tariffs and foreign aid cuts are also options). Triple the number of ICE officers.As the president of the ICE Officers’ Council explained in Congressional testimony: “Only approximately 5,000 officers and agents within ICE perform the lion’s share of ICE’s immigration mission … Compare that to the Los Angeles Police Department at approximately 10,000 officers. Approximately 5,000 officers in ICE cover 50 states, Puerto Rico and Guam, and we are attempting to enforce immigration law against 11 million illegal aliens already in the interior of the United States. Since 9-11, the U.S. Border Patrol has tripled in size, while ICE’s immigration enforcement arm, Enforcement and Removal Operations (ERO), has remained at relatively the same size.” This will be funded by accepting the recommendation of the Inspector General for Tax Administration and eliminating tax credit payments to illegal immigrants. Mandatory return of all criminal aliens.All criminal aliens must be returned to their home countries, a process which can be aided by canceling any visas to foreign countries that will not accept their own criminals, and making it a separate and additional crime to commit an offense while here illegally. Detention, not catch-and-release.Illegal aliens apprehended crossing the border must be detained until they are sent home. Defund sanctuary cities.Cut off federal grants to any city which refuses to cooperate with federal law enforcement. Enhanced penalties for overstaying a visa.Millions of people come to the United States on temporary visas but refuse to leave, without consequence. This is a threat to national security. Individuals who refuse to leave at the time their visa expires should be subject to criminal penalties; this will help give local jurisdictions the power to hold visa overstays until federal authorities arrive. Completion of a visa tracking system – required by law but blocked by lobbyists – will be necessary as well. Cooperate with local gang task forces.ICE officers should accompany local police departments conducting raids of violent street gangs like MS-13 and the 18th Street Gang, which have terrorized the country. All illegal aliens in gangs should be apprehended and deported. End birthright citizenship.This remains the biggest magnet for illegal immigration. By a 2-1 ratio, voters say it’s the wrong policy. Put American workers first. Nearly 40% of black teenagers and nearly 30% of Hispanic teenagers are unemployed. For black Americans without high school diplomas, more than 70% were employed in 1960, compared to less than 40% in 2000. The influx of foreign workers holds down salaries, keeps unemployment high, and makes it difficult for poor and working class Americans – including immigrants themselves and their children – to earn a middle class wage. Nearly half of all immigrants and their US-born children currently live in or near poverty, including more than 60 percent of Hispanic immigrants. Every year, we voluntarily admit another 2 million new immigrants, guest workers, refugees, and dependents, growing our historic record population of 42 million immigrants. We need to control the admission of new low-earning workers in order to: help wages grow, get teenagers back to work, aid minorities’ rise into the middle class, help schools and communities falling behind, and to ensure our immigrant members of the national family become part of the American dream. Increase the prevailing wage for H-1Bs. Up to two-thirds of entry-level hiring for IT jobs is accomplished through the H-1B program. More than half of H-1B visas are issued for the program’s lowest allowable wage level, and more than 80 percent for its bottom two. Raising the prevailing wage paid to H-1Bs will force companies to give these entry-level jobs to the domestic pool of unemployed native and immigrant workers in the U.S., instead of flying in cheaper workers from overseas. Require companies to hire American workers first. Too many visas, like the H-1B, have no such requirement. In 2015, with 92 million Americans outside the workforce and incomes collapsing, we need companies to hire from the domestic pool of unemployed. End welfare abuse. Applicants for entry to the United States should be required to certify that they can pay for their own housing, health care and other needs before coming to the U.S.
Offer jobs programs for inner city youth. The J-1 visa jobs program for foreign youth will be terminated and replaced with a resume bank for inner city youth provided to all corporate subscribers to the J-1 visa program. Improve the refugee program for American children. Increase standards for the admission of refugees and asylum-seekers to crack down on abuses. Use the monies saved on refugee programs to help place American children without parents in safer homes and communities, and to improve community safety in high crime neighborhoods in the United States. Reform immigration. Before any new green cards are issued to foreign workers abroad, there will be a pause where employers will have to hire from the domestic pool of unemployed immigrant and native workers. Repeal Obamacare. Our elected representatives must eliminate the individual mandate. No person should be required to buy insurance unless he or she wants to. Modify laws that inhibit the sale of health insurance across state lines. As long as the plan purchased complies with state requirements, any vendor ought to be able to offer insurance in any state. By allowing full competition in this market, insurance costs will go down and consumer satisfaction will go up. Allow individuals to fully deduct health insurance premium payments from their tax returns. Businesses are allowed to take these deductions, so why wouldn’t Congress allow individuals the same exemptions? As we allow the free market to provide insurance coverage opportunities to companies and individuals, we must also make sure that no one slips through the cracks simply because they cannot afford insurance. We must review basic options for Medicaid and work with states to ensure that those who want health care coverage can have it. Allow individuals to use Health Savings Accounts (HSAs). Contributions into HSAs should be tax-free and should be allowed to accumulate. These accounts would become part of the estate of the individual and could be passed on to heirs without fear of any death penalty. These plans should be particularly attractive to young people who are healthy and can afford high-deductible insurance plans. These funds can be used by any member of a family without penalty. Require price transparency from all health care providers, especially doctors and health care organizations like clinics and hospitals. Individuals should be able to shop to find the best prices for procedures, exams or any other medical-related procedure. Remove barriers to entry into free markets for drug providers that offer safe, reliable and cheaper products. Though the pharmaceutical industry is in the private sector, drug companies provide a public service. Allowing consumers access to imported, safe and dependable drugs from overseas will bring more options to consumers. Providing health care to illegal immigrants costs us some $11 billion annually. If we were to simply enforce the current immigration laws and restrict the unbridled granting of visas to this country, we could relieve health care cost pressures on state and local governments. To reduce the number of individuals needing access to programs like Medicaid and the Children’s Health Insurance Program, we will need to install programs that grow the economy and bring capital and jobs back to America. The best social program has always been a job – and taking care of our economy will go a long way toward reducing our dependence on public health programs. Declare China a currency manipulator. Economists estimate the Chinese yuan is undervalued by anywhere from 15% to 40%. This gives Chinese exporters a huge advantage while imposing the equivalent of a heavy tariff on U.S. exports to China. This has resulted in chronic U.S. trade deficits, a severe weakening of the U.S. manufacturing base and the loss of tens of millions of American jobs. In a system of truly free trade and floating exchange rates like a Trump administration would support, America’s massive trade deficit with China would not persist. On day one of the Trump administration, the U.S. Treasury Department will designate China as a currency manipulator. This will begin a process that imposes countervailing duties on artificially cheap Chinese products. The U.S. Treasury’s designation of China as a currency manipulator will force China to the negotiating table and open the door to a fair – and far better – trading relationship. End China’s intellectual property violations. China’s ongoing theft of intellectual property may be the greatest transfer of wealth in history. This theft costs the U.S. more than $300 billion and millions of jobs each year. We will enforce stronger protections against Chinese hackers and counterfeit goods. Our responses to Chinese theft will be swift, robust and unequivocal. The Chinese government also forces American companies like Boeing, GE and Intel to transfer proprietary technologies to Chinese competitors as a condition of entry into the Chinese market. We will adopt a zero tolerance policy on intellectual property theft and forced technology transfer. Eliminate China’s illegal export subsidies and other unfair advantages. Chinese manufacturers and other exporters receive numerous illegal export subsidies from the Chinese government. These include – in direct contradiction to WTO rules – free or nearly free rent, utilities, raw materials and many other services. China’s state-run banks routinely extend loans to these enterprises at below market rates or without the expectation they will be repaid. China even offers them illegal tax breaks or rebates as well as cash bonuses to stimulate exports. The U.S. trade representative recently filed yet another complaint with the WTO accusing China of cheating on our trade agreements by subsidizing its exports. The Trump administration will not wait for an international body to tell us what we already know. To gain negotiating leverage, we will pursue the WTO case and aggressively highlight and expose these subsidies. The Trump plan will strengthen our negotiating position. Lower the corporate tax rate to 15% to unleash American ingenuity here at home and make us more globally competitive. This tax cut puts our rate 10 percentage points below China and 20 points below our current rate. Strengthen the U.S. military and deploy it appropriately in the East and South China seas. These actions will discourage Chinese adventurism that imperils American interests in Asia. Give veterans the freedom to choose and force the VA to compete for their dollars. Under a Trump Administration, all veterans eligible for VA health care can bring their veteran’s ID card to any doctor or care facility that accepts Medicare to get the care they need immediately. Treat the whole veteran. We must recognize that today’s veterans have very different needs than those of the Greatest Generation. Increase funding for post-traumatic stress disorder (PTSD), traumatic brain injury and suicide prevention services to address our veterans’ invisible wounds. Service members are five times more likely to develop depression than civilians. They are almost 15 times more likely to develop PTSD than civilians. This funding will help provide more and better counseling and care. More funding also will support research on best practices and state-of-the-art treatments to keep our veterans alive, healthy and whole. Increase funding for job training and placement services (including incentives for companies hiring veterans), educational support and business loans. Better support our women veterans. The fact that many VA hospitals don’t permanently staff OB/GYN doctors shows a lack of respect for the growing number female veterans. In addition, women veterans can always choose a different OB/GYN in their community using their veteran’s ID card. Fire incompetent VA executives. New leadership will focus the VA staff on delivering timely, top quality care and other services. End waste, fraud and abuse at the VA. The days of $6.3 million for statues and fountains at VA facilities and $300,000 for a manager to move 140 miles are over. Modernize the VA. The VA has been promising to modernize for years without real results. The Trump plan will make it happen by accelerating and expanding investments in state-of-the-art technology to deliver best-in-class care quickly and effectively. Empower caregivers to ensure our veterans receive quality care quickly. Caregivers should be able to streamline treatment plans across departments and utilize telehealth tools to better serve their patients. Hire more veterans to care for veterans.The more veterans we have working at the VA, the better the VA will be. They understand the unique challenges facing their community. To increase the number of veterans hired by the VA, this plan will add five points to the qualifying scores of veterans applying for VA jobs. Embed satellite VA clinics in rural and other underserved areas. This will ensure veterans have easy access to care and local hospitals, and care facilities can handle the influx of patients without backlogs while tapping the specialized knowledge of VA health specialists. The Trump plan will revise and update both the individual and corporate tax codes. The Trump plan will collapse the current seven tax brackets to three. The rates and break points are as shown below. The tax brackets are similar to those in the House GOP tax blueprint. The Trump plan will retain the capital gains rate structure (maximum rate of 20 percent) with tax brackets shown above. Carried interest will be taxed as ordinary income. The Trump plan will repeal the death tax, but capital gains held until death will be subject to tax, with the first $10 million tax-free as under current law to exempt small businesses and family farms. To prevent abuse, contributions of appreciated assets into a private charity established by the decedent or the decedent’s relatives will be disallowed. All but the wealthiest Americans will be able to take an above-the-line deduction for children under age 13 that will be capped at the state average for the age of the child, and for elder care for a dependent. The exclusion will not be available to taxpayers with total income of more than $500,000 married-joint/$250,000 single. The child care exclusion would be provided to families who use stay-at-home parents or grandparents as well as those who use paid caregivers, and would be limited to four children per taxpayer. The elder care exclusion would be capped at $5,000 per year. The cap would increase each year at the rate of inflation. The Trump plan would offer spending rebates for child care expenses to certain low-income taxpayers through the Earned Income Tax Credit (EITC). The rebate would be equal to 7.65 percent of remaining eligible child care expenses, subject to a cap of half of the payroll taxes paid by the taxpayer (based on the lower-earning parent in a two-earner household). This rebate would be available to married-joint filers earning $62,400 ($31,200 for single taxpayers) or less. Limitations on costs eligible for exclusion and the number of beneficiaries would be the same as for the basic exclusion. The ceiling would increase with inflation each year. To encourage low-income families to establish DCSAs for their children, the government will provide a 50 percent match on parental contributions of up to $1,000 per year. When parents fill out their taxes, they can check a box to directly deposit any portion of their EITC into their Dependent Care Savings Account. All deposits and earnings thereon will be free from taxation, and unused balances can roll over from year to year. The Trump plan will lower the business tax rate from 35 percent to 15 percent, and eliminate the corporate alternative minimum tax. This rate is available to all businesses, both big and small, that that want to retain the profits within the business. It eliminates most corporate tax expenditures, except for the research and development credit. Firms engaged in manufacturing in the U.S. may elect to expense capital investment and lose the deductibility of corporate interest expense. An election once made can be revoked only within the first three years of election; if revoked, returns for prior years would need to be amended to show revised status. The annual cap for the business tax credit for on-site child care authorized by Sec. 205 of the Economic Growth and Tax Relief Reconciliation Act of 2001 would be increased to $500,000 per year (up from $150,000), and the recapture period would be reduced to five years (down from 10 years). Businesses that pay a portion of an employee’s child care expenses can exclude those contributions from income. Employees who are recipients of direct employer subsidies would not be able to exclude those costs from the individual income tax, and the costs of direct subsidies to employees could not be used as a cost eligible for the credit. Enforce the laws on the books. Several years ago there was a tremendous program in Richmond, Va., called Project Exile. It said that if a violent felon uses a gun to commit a crime, he will be prosecuted in federal court and sent to prison for five years – no parole or early release. Murders committed with guns in Richmond decreased by more than 60% when Project Exile was in place – in the first two years of the program alone, 350 armed felons were taken off the street. Here’s another important way to fight crime: Empower law-abiding gun owners to defend themselves. That’s why I’m a gun owner, that’s why I have a concealed carry permit, and that’s why tens of millions of Americans have concealed carry permits as well. Fix our broken mental health system. We need to expand treatment programs, because most people with mental health problems aren’t violent, they just need help. But for those who are violent, a danger to themselves or others, we need to get them off the street. Defend the rights of law-abiding gun owners. Gun and magazine bans are a total failure. That’s been proven every time it’s been tried. Law-abiding people should be allowed to own the firearm of their choice. There has been a national background check system in place since 1998. Every time a person buys a gun from a federally licensed gun dealer – which is the overwhelming majority of all gun purchases – they go through a federal background check. Study after study has shown that very few criminals try to pass a background check – they get their guns from friends/family members or by stealing them. So the overwhelming majority of people who go through background checks are law-abiding gun owners. Too many states are failing to put criminal and mental health records into the system – and it should go without saying that a system’s only going to be as effective as the records that are put into it. The right of self-defense doesn’t stop at the end of your driveway. A concealed carry permit should be valid in all 50 states. A driver’s license works in every state, so it’s common sense that a concealed carry permit should work in every state. Banning our military from carrying firearms on bases and at recruiting centers is ridiculous. We train our military how to safely and responsibly use firearms, but our current policies leave them defenseless. We need to allow them to defend themselves. By 2017, the national debt will be $20 trillion. That is arguably the single greatest threat to our national security. The idea that we can somehow balance the federal budget without cutting military spending and reforming entitlements is fantasy. Gov. Johnson has pledged that his first major act as president will be to submit to Congress a truly balanced budget. No gimmicks, no imaginary cuts in the distant future. No line in the budget will be immune from scrutiny and reduction. And he pledges to veto any legislation that will result in deficit spending, forcing Congress to override his veto in order to spend money we don’t have. The tax code is more than 70,000 pages, enforced by a government agency with almost 100,000 employees. As a result, our tax code has created a nightmare for the average American, while providing shelter for those with the means to manipulate it. Gov. Johnson advocates for the elimination of special-interest tax loopholes, to get rid of double taxation on small businesses, and ultimately, the replacement of all income and payroll taxes with a single consumption tax that determines your tax burden by how much you spend, not how much you earn. Such a tax would be structured to ensure that no one’s tax burden for the purchase of basic family necessities would be increased. To the contrary, costs of necessities would likely decrease with the elimination of taxes already included in the price of virtually everything we buy. Under a republican form of government, representatives should be accountable to all people, not institutional forces like lobbyists, special interests and partisan gamesmanship. Yet today, politicians often are unable to do their job because they are incentivized to do what it takes to get re-elected. This doesn’t make them bad people. But it does make for bad representation. This is why we adopted the 22nd Amendment in 1947, to limit the number of terms a president can hold office to two terms. As spending continues unchecked, wars continue and government keeps taking away more freedoms, the dedication that politicians have to getting re-elected keeps them from doing the job they were elected to do in the first place. That’s why Johnson is a strong advocate of term limits. And that’s why Gov. Bill Weld served as national co-chairman of U.S. Term Limits. Johnson has said that “As governor, I didn’t create a single job.” His point, of course, is that government doesn’t “create” jobs. Entrepreneurs, businesses and economic prosperity are the building blocks for job growth. Govs. Johnson and Weld believe that we must allow a regulatory and tax environment that incentivizes fairness, not one that picks winners and losers. Johnson and Weld helped create conditions for job growth in their states. In the White House, they will create the conditions for massive job growth across the entire country. Our founding fathers established the 4th Amendment, for example, to prevent the government from snooping into our private lives without a warrant. Today, we have a national government that spies on private communications, monitors your financial transactions, photographs your license plates and even will track everything you do at a public library — all without warrants or due process of law. Johnson and Weld want to get the government out of your life. Out of your cell phone. Out of your bedroom. And back into the business of protecting your freedoms, not restricting them. This is why Johnson embraced marriage equality before many current Democratic leaders joined the parade. He also calls for an end to the drug war and to start treating drug abuse like a disease instead of a crime. Weld was not only an early proponent of civil rights for gays and lesbians, he appointed the judge who wrote the opinion that established marriage equality as a matter of constitutional right. He also is an outspoken defender of a woman’s right to choose, rather than allow the government to make such an important and personal decision for them. Johnson believes that people should make choices in their personal lives. Responsible adults should be free to marry whom they want, arm themselves if they want, and lead their personal lives as they see fit — as long as they aren’t harming anyone else in doing so. For Gov. Johnson, honoring our veterans begins with a pledge that those serving in the military today will be asked to go into harm’s way only for clear, defined and justified reasons. They will not be sent to risk their lives just because politicians decide to topple a foreign government — with no clear U.S. interest in doing so or plan for what comes next. Our military will not be asked to engage in nation-building or to resolve conflicts on the other side of the globe that have defied resolution for hundreds of years. The men and women of our military will be asked only to protect and defend the United States – and to do so with a firm understanding of the objective. For our veterans who have served and returned to civilian life, many with injuries and emotional scars, Gov. Johnson pledges to provide them with the health care, support and transitional assistance they deserve. From elder care to PTSD to the specific health challenges of women who have served in uniform, veterans have a wide range of urgent needs. For some, the VA medical system is the best or only option. That system must function efficiently, provide timely care, and meet the standards we would expect for our own family members. For those who need care from private physicians or hospitals, that option must be available. A strong believer in the power of competition and the marketplace, Johnson will bring that power to bear in the provision of care to our veterans. Likewise, as many veterans’ organizations have asked, Johnson will remove federal obstacles to the testing and use of medical cannabis to treat PTSD and other conditions for which it has shown promise. Johnson believes it is part of our moral contract with those who have served to not only maintain the GI Bill, but to enhance public-private partnerships designed to match veterans’ skills with the career choices they wish to make. Gov. Johnson also understands that family support, counseling and other tools for helping veterans deal with their challenges are essential. Homelessness, substance abuse and suicide are all-too frequent among veterans as they re-enter civilian life – and our obligation to support those who have served does not end when they sign their discharge papers. The objectives of both our foreign policy and our military should be straightforward: To protect us from harm and to allow us to exercise our freedoms. As president, Johnson will move quickly to cut off funding on which violent extremist armies depend. He will repair relationships with our allies. And he will send our brave soldiers to war only when clearly authorized by Congress after meaningful, transparent deliberation and debate. Having served as governor of a border state, Johnson knows the complex issues associated with immigration reform firsthand. Solving immigration problems is not as easy as building a wall or simply offering amnesty. Johnson and Weld believe that we should focus on creating a more efficient system of providing work visas, conducting background checks and incentivizing non-citizens to pay their taxes, obtain proof of employment and otherwise assimilate with our diverse society. How is it that the United States, the land of the free, has one of the highest incarceration rates in the world? The answer is simple: Over time, politicians have criminalized far too many aspects of people’s personal lives. The failed war on drugs is the greatest example. Well over 100 million Americans have, at one time or another, used marijuana. Yet, today, simple possession and use of marijuana remains a crime — despite the fact that a majority of Americans now favor its legalization. And who is most harmed by the war on drugs? Minorities, the poor and anyone else without access to high-priced attorneys. More generally, mandatory minimum sentences for a wide range of offenses and other efforts by politicians to be “tough” have removed far too much discretion from judges and prosecutors. It is no coincidence that the innovation and entrepreneurship the internet has allowed and the resulting improvements to our daily lives have happened largely without interference from the government. Johnson has often said, “There is nothing wrong with the internet that I want the government to fix.” Nothing in history has allowed for more innovation than the internet. It has literally changed our world. Congress recently passed cyber security legislation which, like the Patriot Act, gives bureaucrats in Washington, D.C., the power to monitor and collect information about our private lives. Other politicians are demanding that unelected agents of the government be granted “back doors” into encrypted and private data so they can gather confidential information without anyone knowing about it. Security, they argue, depends on the mass collection of personal and private data. Security is important, for sure. But throwing away our right to privacy has the opposite effect of protecting our freedom. That’s why the Fourth Amendment says that the government can’t snoop into our private lives unless they have a good reason to do so. Johnson and Weld believe strongly that the first responsibility of government is to protect citizens from those who would do them harm, whether it be a foreign aggressor, a criminal or someone who harms the environment. Gov. Johnson believes the Environmental Protection Agency, when focused on its true mission, plays an important role in keeping the environment and citizens safe. Johnson does not, however, believe the government should be engaging in social and economic engineering. Preventing a polluter from harming our water or air is one thing. Having politicians in Washington, D.C., acting on behalf of high-powered lobbyists determine the future of clean energy innovation is another. In a healthy economy that allows the market to function unimpeded, consumers, innovators and personal choices will do more to bring about environmental protection and restoration than will government regulations driven by special interests. But the critical question is whether politicians’ efforts to regulate, tax and manipulate the private sector are cost-effective – or effective at all. The debate should be about how we can protect our resources and environment for future generations. Johnson and Weld believe that the federal government should prevent future harm by focusing on regulations that protect us from real harm. As governor, Johnson sought to have a substantive discussion about the best way to provide a good education for our children. He did so while working with an overwhelmingly Democratic legislature and despite fierce opposition from special interests. He advocated a universally available program for school choice. Competition, he believes, will make our public and private educational institutions better. Most important, Johnson believes that state and local governments should have more control over education policy. That is why he believes we should eliminate the federal Department of Education. Common Core and other attempts to impose national standards and requirements on local schools are costly, overly bureaucratic and compromise our ability to provide our children with a good education. Gov. Johnson’s approach to governing is based on a belief that individuals should be allowed to make their own choices in their personal lives. Abortion is a deeply personal choice. Johnson has the utmost respect for the deeply-held convictions of those on both sides of the abortion issue. It is an intensely personal question, and one that government is ill-equipped to answer. On a personal level, Johnson believes in the sanctity of the life of the unborn. As governor, he supported efforts to ban late-term abortions. However, Johnson recognizes that the right of a woman to choose is the law of the land, and has been for several decades. That right must be respected and despite his personal aversion to abortion, he believes that such a very personal and individual decision is best left to women and families, not the government. Women seeking to exercise their legal right must not be subjected to prosecution or denied access to health services. Legalizing and regulating marijuana will save lives and make our communities safer by eliminating crime and creating an industry that can legitimately participate in America’s economy. The federal government should not stand in the way of states that choose to legalize marijuana. Johnson and Weld would remove cannabis from Schedule I of the federal Controlled Substances Act, which will allow individual states to make their own decisions about both recreational and medical marijuana — just as they have done for decades with alcohol. This also would allow testing of marijuana for medical purposes, as well as regulation that reflects individual states’ values and needs. We need to treat drug abuse as a health issue, not a crime. We can save thousands of lives and billions of dollars by simply changing our approach to drug abuse. That is why Johnson came out as an early proponent on the national stage in 1999 while governor of New Mexico, and publicly stated his support of marijuana legalization. Johnson and Weld do not support the legalization of other recreational drugs that are currently illegal. It is, however, their belief that drug rehabilitation and harm-reduction programs result in a more productive society than incarceration and arrests for drug use. Restore basic fairness to the tax code.Hillary will implement a “fair share surcharge” on multi-millionaires and billionaires and fight for measures like the Buffett Rule to ensure the wealthiest Americans do not pay a lower tax rate than middle-class families. She’ll close loopholes that create a private tax system for the most fortunate, and she’ll ensure multi-million-dollar estates are paying their fair share of taxes. Close corporate and Wall Street tax loopholes.Hillary will close tax loopholes like inversions that allow companies to shift profits and jobs overseas. She will charge an “exit tax” for companies leaving the U.S. to settle their untaxed foreign earnings. She will close tax loopholes that let Wall Street money managers pay lower rates than some middle-class families. And she’ll reward businesses that invest in jobs in the United States. Simplify and cut taxes for small businesses.The smallest businesses, with one to five employees, spend 150 hours and $1,100 per employee on federal tax compliance. That’s more than 20 times higher than the average for far larger firms. Provide tax relief to working families.For too many years, middle-class families have been squeezed by rising costs for everything from child care to health care to affording college. Hillary will offer relief from these rising costs, including tax relief for Americans facing excessive out-of-pocket health care costs and for those caring for an ill or elderly family member. Pay for ambitious investments in a fiscally responsible way.Hillary believes that we can afford to pay for ambitious, progressive investments in good-paying jobs, debt-free college and other measures to strengthen growth, broaden opportunity and reduce inequality. Hillary will use the proceeds from ensuring the wealthiest and the largest corporations pay their fair share to pay for these investments without adding to the federal debt. The United States has less than 5 percent of the world’s population but almost 25 percent of the total prison population. A significant percentage of the more than 2 million Americans incarcerated today are nonviolent offenders. African American men are far more likely to be stopped and searched by police, charged with crimes and sentenced to longer prison terms than white men found guilty of the same offenses. 1. Strengthen bonds of trust between communities and police. Bringing law enforcement and communities together to develop national guidelines on the use of force by police officers, making it clear when deadly force is warranted and when it isn’t and emphasizing proven methods for de-escalating situations. Acknowledging that implicit bias still exists across society — even in the best police departments — and tackle it together.Hillary will commit $1 billion in her first budget to find and fund the best training programs, support new research and make this a national policing priority. Making new investments to support state-of-the-art law enforcement training programs at every levelon issues like use of force, de-escalation, community policing and problem solving, alternatives to incarceration, crisis intervention, and officer safety and wellness. Supporting legislation to end racial profilingby federal, state and local law enforcement officials. Strengthening the U.S. Department of Justice’s pattern or practice unit — the unit that monitors civil rights violations — by increasing the department’s resources, working to secure subpoena power and improving data collection for pattern or practice investigations. Doubling funding for the U.S. Department of Justice “Collaborative Reform” program.Across the country, there are police departments deploying creative and effective strategies that we can learn from and build on. Hillary will provide assistance and training to agencies that apply these best practices. Providing federal matching funds to make body cameras available to every police department in America. Promoting oversight and accountability in use of controlled equipment,including by limiting the transfer of military equipment to local law enforcement from the federal government, eliminating the one-year use requirement, and requiring transparency from agencies that purchase equipment using federal funds. Collecting and reporting national datato inform policing strategies and provide greater transparency and accountability when it comes to crime, officer-involved shootings and deaths in custody. 2. End the era of mass incarceration. Cutting mandatory minimum sentences for nonviolent drug offenses in half. Allowing current nonviolent prisoners to seek fairer sentences. Eliminating the sentencing disparity for crack and powder cocaine so that equal amounts of crack and powder cocaine carry equal sentences, and applying this change retroactively. Reforming the “strike” system, so that nonviolent drug offenses no longer count as a “strike,” reducing the mandatory penalty for second- and third-strike offenses. Focusing federal enforcement resources on violent crime, not simple marijuana possession.Marijuana arrests, including for simple possession, account for a large number of drug arrests. Significant racial disparities exist in marijuana enforcement — black men are significantly more likely to be arrested for marijuana possession than their white counterparts, despite the fact that their usage rates are similar. Hillary will allow states that have enacted marijuana laws to act as laboratories of democracy and reschedule marijuana from a Schedule I to a Schedule II substance. Prioritizing treatment and rehabilitation — rather than incarceration — for low-level nonviolent drug offenders.More than half of prison and jail inmates suffer from a mental health problem. Up to 65 percent of the correctional population meets the medical criteria for a substance use disorder. Hillary will ensure law enforcement is properly trained for crisis intervention and referral to treatment as appropriate, and direct the attorney general to urge federal prosecutors to seek treatment over incarceration for low-level nonviolent drug crimes. Dismantling the school-to-prison pipeline.Hillary will provide $2 billion in support to schools to reform overly punitive disciplinary policies, calling on states to reform school disturbance laws, and encouraging states to use federal education funding to implement social and emotional support interventions. Ending the privatization of prisons. We must not create private industry incentives that may contribute — or have the appearance of contributing — to over-incarceration. The campaign does not accept contributions from federally registered lobbyists or PACs for private prison companies and will donate any such direct contributions to charity. 3. Promote successful re-entry by formerly incarcerated individuals. Taking executive action to “ban the box” for federal employers and contractors,so that applicants have an opportunity to demonstrate their qualifications before being asked about their criminal records. Investing $5 billion in re-entry job programs for formerly incarcerated individuals. Supporting legislation to restore voting rights to individuals who have served their sentences. Reform our criminal justice systemby reforming sentencing laws and policies, ending racial profiling by law enforcement, and strengthening the bonds of trust between communities and police. Protect the right to voteby fighting to repair the Voting Rights Act and implementing universal, automatic voter registration so that every American will be registered to vote when they turn 18, unless they opt out. Protect immigrants’ rights and keep families togetherby fighting for a full and equal pathway to citizenship and an end to family detention and private immigrant detention centers. End the epidemic of gun violence in our communities.Gun violence is the leading cause of death for young African American men — more than the next nine leading causes combined. We must crack down on gun stores that flood our communities with illegal guns. Fight against environmental injustice.Too many children in low-income housing are exposed to lead. African American children are twice as likely to suffer from asthma as white children. Half of our nation’s Latino population lives in areas where the air quality does not meet the EPA’s health standards — and climate change will put vulnerable populations at even greater risk. As president, Hillary will work to reduce air pollution, invest in the removal of toxins like lead, develop greener and more resilient infrastructure, tackle energy poverty and boost efforts to clean up highly polluted toxic sites. Close the education achievement gapby making sure every child has a world-class education from birth through college. Hillary will double America’s investment in Early Head Start, ensure that every 4-year-old in America has access to high-quality preschool, drive student achievement in K-12 schools, make college affordable and relieve the burden of student debt. End violence against the transgender community, particularly women of color. Revitalize the economy in communities that have been left out and left behind through a “Breaking Every Barrier Agenda”that includes $125 billion in targeted investments to create good-paying jobs, rebuild crumbling infrastructure and connect housing to opportunity. Ensure equal treatment for citizens in Puerto Rico.Hillary believes that Puerto Ricans must be treated equally by Medicare, Medicaid and other programs that benefit families. She also will work with the people of Puerto Rico and with advocates from all sides to answer the fundamental question of their political status. Fight for full federal equality for LGBT Americans.Hillary will work with Congress to pass the Equality Act, continue President Obama’s LGBT equality executive actions, and support efforts underway in the courts to protect people from discrimination on the basis of gender identity and sexual orientation in every aspect of public life. Support LGBT youth, parents and elders.Hillary will end so-called “conversion therapy” for minors, combat youth homelessness by ensuring adequate funding for safe and welcoming shelters, and take on bullying and harassment in schools. She’ll end discriminatory treatment of LGBT families in adoptions, and protect LGBT elders against discrimination. Honor the military service of LGBT people.Hillary applauds the Pentagon’s decision to allow transgender personnel to serve openly, and as commander-in-chief, she will upgrade service records of LGBT veterans dismissed due to their sexual orientation. Fight for an AIDS-free generation. Protect transgender rights.Hillary will work to protect transgender individuals from violence, make it easier for transgender Americans to change their gender marker on identification documents, and invest in law enforcement training focused on fair and impartial policing, including in interactions with LGBT people. Promote human rights of LGBT people around the world.Hillary will promote LGBT human rights and ensure America’s foreign policy is inclusive of LGBT people, including increasing our investment in the Global Equality Fund to advance human rights. Make preschool universal for every 4-year-old in America within 10 years.Despite research showing its benefits, only about half of the roughly 8.1 million 3- and 4-year-olds in the United States are enrolled in preschool, with only one in four enrolled in publicly funded preschool. Significantly increase child care investments so that no family in America has to pay more than 10 percent of its income to afford high-quality child care.The cost of child care has increased by nearly 25 percent during the past decade, while the wages of working families have stagnated. Hillary will fight for every family in America to have access to high quality, affordable child care by significantly increasing the federal government’s investment in child care subsidies and providing tax relief for the cost of child care to working families. Improve the quality of child care and early learning by giving a RAISE to America’s child care workforce. To increase the quality of child care in America and pay child care workers for the true value of their work, Hillary will create the Respect And Increased Salaries for Early childhood educators (RAISE) initiative. Double our investment in Early Head Start and the Early Head Start–Child Care Partnership program.Early Head Start provides services to our youngest learners and their families — including health, nutrition and pre-literacy support with a strong focus on children’s social and emotional development. Expand access to evidence-based home visiting programs.There is increasing scientific evidence that brain development in the earliest years of childhood is crucial to economic success. That’s why Hillary will double our investment in home visiting programs such as the Maternal, Infant and Early Childhood Home Visiting (MIECHV) program. These programs, which provide home visits by a social worker or nurse during and directly after pregnancy, significantly improve maternal and child health, development and learning. Award scholarships of up to $1,500 per year to help up to 1 million student parents afford high-quality child care.More than 25 percent of all college students are balancing school with raising a child. We should support them, not only because the economic benefit of a college degree lifts their own earning prospects, but also because it lifts the future earnings of their children too. Hillary will launch the Student Parents in America Raising Kids (SPARK) program. SPARK will award scholarships of up to $1,500 per year to up to 1 million student parents. Recipients can use the awards for costs that create barriers to success, including child care and emergency financial aid. Increase access to high-quality child care on college campuses by serving an additional 250,000 children. Student parents spend two hours less on average per day on educational activities. And while nearly half of student parents attend two-year colleges, less than half of all two-year college campuses in America offer on-campus child care services.. Hillary will work to dramatically increase access to child care on campus by increasing funding for campus-based child care centers. Launch a national campaign to modernize and elevate the profession of teaching. Hillary will prepare, support and pay every child’s teacher as if the future of our country is in their hands — because it is. Provide every student in America an opportunity to learn computer science.There are more than half a million open jobs that require computing skills, but the majority of schools in the United States don’t offer computer science. Hillary will provide states and school districts funding to help scale computer science instruction and lessons that improve student achievement or increase college enrollment and completion in CS Ed fields. Rebuild America’s schools. Hillary will expand the Build America Bonds program to provide cities and towns the capital they need to rebuild their schools. These “Modernize Every School Bonds” will double the Build America Bonds subsidy for efforts to fix and modernize America’s classrooms, from increasing energy efficiency and tackling asbestos to upgrading science labs and high-speed broadband. Costs won’t be a barrier. Every student should have the option to graduate from a public college or university in their state without taking on any student debt.By 2021, families with income up to $125,000 will pay no tuition at in-state four-year public colleges and universities. And from the beginning, every student from a family making $85,000 a year or less will be able to go to an in-state four-year public college or university without paying tuition. All community colleges will offer free tuition. Everyone will do their part.States will have to invest in higher education, and colleges and universities will be held accountable for the success of their students and for controlling tuition costs. A $25 billion fund will support historically black colleges and universities, Hispanic-serving institutions, and other minority-serving institutionsin building new ladders of opportunity for students. Debt won’t hold you back. Borrowers will be able to refinance loans at current rates,providing debt relief to an estimated 25 million people. They’ll never have to pay back more than 10 percent of their income, and all remaining college debt will be forgiven after 20 years. Delinquent borrowers and those in default will get helpto protect their credit and get back on their feet. To reduce the burden for future borrowers, Hillary will significantly cut interest ratesso the government never profits from college student loans. Hillary’s plan will crack down on predatory schools, lenders and bill collectors. A new payroll deduction portal for employers and employees will simplify the repayment process. Hillary will explore more options to encourage employers to help pay down student debt. Aspiring entrepreneurs will be able to defer their loans with no payments or interest for up to three years.Social entrepreneurs and those starting new enterprises in distressed communities will be eligible for up to $17,500 in loan forgiveness. Hillary will take immediate executive action to offer a three-month moratorium on student loan payments to all federal loan borrowers.That will give every borrower a chance to consolidate their loans, sign up for income-based repayment plans and take advantage of opportunities to reduce their monthly interest payments and fees. Unlocking access to capital.We need to give small businesses, including women- and minority-owned small businesses, access to the financing they need to build, grow and hire. Hillary will work to boost small-business lending by easing burdens for community banks and credit unions. Her plan also will allow entrepreneurs to defer student-loan payments with no interest while they get their ventures off the ground. Cutting red tape to streamline the process of starting a small business.It shouldn’t take longer to start a small business in the United States than it does in Canada or Denmark. Hillary will offer state and local governments new federal incentives to cut red tape and streamline licensing to make it less costly to start a small business. Providing tax relief for small businesses.America’s smallest businesses — those with one to five employees — spend 150 hours and $1,100 per employee making sure they comply with federal tax laws. That’s more than 20 times higher than the average for larger firms. Hillary will create a new standard deduction for small businesses similar to the one available to individual filers. She will simplify the rules so small businesses can track and file their taxes as easily as filling out a checkbook or printing a bank statement. And her plan would quadruple the start-up tax deduction to significantly lower the cost of starting a business. Incentivize health care benefits for small businesses and their employees.Hillary will expand the health care tax credit for small employers with up to 50 employees through the Affordable Care Act. And she will simplify phase-out and eligibility rules so that it’s easier for many more small businesses to get the credit and cover their workers. Opening new markets. We should invest in the roads, bridges, ports and airports that make it easier for small businesses to reach new customers, and encourage innovations that unlock new markers for small businesses. Making sure small businesses get paid.Hillary will stop large companies from using litigation hurdles to deny small businesses payment for services, and she’ll give small businesses recourse to take on predatory behavior. Supporting small-business owners and entrepreneurs.Hillary will work to provide incubators, mentoring and training to 50,000 entrepreneurs and small-business owners in underserved communities across the country. Making the federal government more responsive to small business.Hillary will push federal agencies to make government more user-friendly, guaranteeing a 24-hour response time to small businesses with questions about federal regulations and access to capital programs. For 80 years, Social Security has been America at its best. Social Security reflects our shared belief that every American should be able to retire with dignity after decades of hard work. Fight any attempts to gamble seniors’ retirement security on the stock market through privatization. Oppose reducing annual cost-of-living adjustments. Oppose efforts to raise the retirement age. Oppose closing the long-term shortfall on the backs of the middle class, whether through benefit cuts or tax increases. The poverty rate for widowed women 65 or older is nearly 90 percent higher than for other seniors — in part because when a spouse dies, families can face a steep benefit cut. For a two-earner couple, those benefit cuts can be as much as 50 percent. Hillary believes that we have to change that by reducing how much Social Security benefits drop when a spouse dies, so that the loss of a spouse doesn’t mean financial hardship or falling into poverty. Millions of women (and men) take time out of the paid workforce to raise a child, take care of an aging parent or look after an ailing family member. That can reduce their Social Security benefits at retirement, since those benefits are calculated based on their top 35 years of earnings. Americans should receive credit toward their Social Security benefits when they are out of the paid workforce because they are acting as caregivers. Preserve Social Security by asking the wealthiest to contribute more. Medicare is the bedrock of health care coverage for more than 50 million American seniors and people with disabilities. As senator, Hillary co-sponsored and sponsored bills to reduce the impact of the Medicare prescription drug gap by reducing the price of pharmaceuticals for seniors. Fight attempts to repeal the Affordable Care Act.The Affordable Care Act made preventive care available and affordable for an estimated 39 million people with Medicare and saved more than 9 million people with Medicare thousands of dollars in prescription drug expenses. Fight plans to privatize or “phase out” Medicare as we know it. Lower drug costs for seniors and other Americans.Hillary will ensure Medicare can negotiate lower drug prices with pharmaceutical companies. Take on the gun lobbyby removing the industry’s legal protection for illegal and irresponsible actions, and revoking licenses from dealers who break the law. Keep guns out of the hands of domestic abusers, other violent criminals and the severely mentally illby supporting laws that stop domestic abusers from buying and owning guns, making it a federal crime for someone to intentionally buy a gun for a person prohibited from owning one, and closing the loopholes that allow people suffering from severe mental illness to purchase and own guns. She also will support work to keep military-style weapons off our streets. Defend and expand the Affordable Care Act, which covers 20 million people. She also will support letting people over 55 years old buy into Medicare. Lower out-of-pocket costs like co-pays and deductibles. Reduce the cost of prescription drugs. Prescription drug spending accelerated from 2.5 percent in 2013 to 12.6 percent in 2014. Protect consumers from prescription drug price increases from companies that market long-standing, life-saving treatments and face little or no competition.Hillary’s plan includes new enforcement tools that make drug alternatives available and increase competition, broaden emergency access to high-quality treatments from developed countries with strong safety standards, and hold drug companies accountable for unjustified price increases with new penalties. Expand access to affordable health care to families regardless of immigration status. Hillary will allow families to buy health insurance on the health exchanges regardless of their immigration status. Expand access to rural Americans. Hillary will explore cost-effective ways to make more health care providers eligible for telehealth reimbursement under Medicare and other programs, including federally qualified health centers and rural health clinics. Double funding for community health centers, and support the health care workforce. Hillary also supports President Obama’s call for a near tripling of the size of the National Health Service Corps. Provide budgetary certainty to facilitate reforms and enable long-term planning. The recent budget deal reached between the Congress and the White House is a promising first step in providing government agencies with much needed fiscal stability. But we must go further by ending the sequester for both defense and non-defense spending in a balanced way. Invest in innovation and capabilities that will allow us to prepare for and fight 21st-century threats.That includes leveraging our information advantage through what’s called “net-centric warfare” capabilities and preparing for asymmetric threats. Create a defense budget that reflects good stewardship of taxpayer dollars.As president, Hillary will prioritize defense reform initiatives, curbing cost growth in areas like health care and acquisition. Take care of our veterans and their families.Hillary has proposed a plan to ensure timely access to quality care; eliminate the claims and appeals backlog; make sure our vets continue to have access to education and economic opportunity; fight substance abuse, mental health disorders and homelessness; and support our military families. Defend, implement and extend smart pollution and efficiency standards,including the Clean Power Plan and standards for cars, trucks and appliances that are already helping clean our air, save families money and fight climate change. Launch a $60 billion Clean Energy Challengeto partner with states, cities and rural communities to cut carbon pollution and expand clean energy, including for low-income families. Invest in clean energy infrastructure, innovation, manufacturing and workforce developmentto make the U.S. economy more competitive and create good-paying jobs and careers. Ensure safe and responsible energy production.As we transition to a clean energy economy, we must ensure that the fossil fuel production taking place today is safe and responsible and that areas too sensitive for energy production are taken off the table. Reform leasingand expand clean energy production on public lands and waters tenfold within a decade. Cut the billions of tax subsidies oil and gas companieshave enjoyed for too long and invest in clean energy. Cut methane emissions across the economyand put in place strong standards for reducing leaks from both new and existing sources. Revitalize coal communitiesby supporting locally driven priorities and make them an engine of U.S. economic growth in the 21st century, as they have been for generations. Make environmental justice and climate justice central prioritiesby setting national goals to eliminate lead poisoning within five years, clean up the more than 450,000 toxic brownfield sites across the country, expand solar and energy efficiency solutions in low-income communities, and create an Environmental and Climate Justice Task Force. Promote conservation and collaborative stewardship.Hillary will keep public lands public, strengthen protections for our natural and cultural resources, increase access to parks and public lands for all Americans, as well as harness the economic potential they offer through expanded renewable energy production, a high quality of life and a thriving outdoor economy. Introduce reformwith a pathway to full and equal citizenship within her first 100 days in office. It will fix the family visa backlog, uphold the rule of law, protect our borders and national security, and bring millions of people into the formal economy. End the three- and 10-year bars.These bars force families, especially those whose members have different citizenship or immigration statuses, into a heartbreaking dilemma: remain in the shadows, or pursue a green card by leaving the country and loved ones behind. Protect families.If Congress keeps failing to act on immigration reform, Hillary will enact a simple system for those with sympathetic cases — such as parents of DREAMers, those with a history of service and contribution to their communities, or those who experience extreme labor violations — to make their case and be eligible for deferred action. Enforce immigration laws humanely. Hillary will focus resources on detaining and deporting those individuals who pose a violent threat to public safety, and ensure refugees who seek asylum in the U.S. have a fair chance to tell their stories. End family detention and close private immigration detention centers. Expand access to health care to all families.We should let families — regardless of immigration status — buy into the Affordable Care Act exchanges. Promote naturalization.Hillary will work to expand fee waivers to alleviate naturalization costs, increase access to language programs to encourage English proficiency, and increase outreach and education to help more people navigate the process. Support immigrant integration.Hillary will create a national Office of Immigrant Affairs, support affordable integration services through $15 million in new grant funding for community navigators and similar organizations, and significantly increase federal resources for adult English language education and citizenship education. 1. Take out ISIS’s stronghold in Iraq and Syria. Intensifying the coalition air campaign against ISIS fighters, leaders and infrastructure. Stepping up support for local Arab and Kurdish forces on the ground and coalition efforts to protect civilians. Pursuing a diplomatic strategy aimed at resolving Syria’s civil war and Iraq’s sectarian conflict between Sunnis and Shias, both of which have contributed to the rise of ISIS. 2. Work with our allies to dismantle global terror networks. Working with European intelligence services to identify and go after enablers who help jihadists forge documents and travel undetected. Targeting efforts to deal with ISIS affiliates from Libya to Afghanistan. Working with tech companies to fight jihadist propaganda online, intercept ISIS communications, andtrack and analyze social media posts to stop attacks, while protecting security and privacy. 3. Harden our defenses at home. Supporting first responders, law enforcement and intelligence officers with the right tools, resources, intelligence and training to prevent attacks. Launching an intelligence surge to get security officials the tools they need to prevent attacks. Keeping assault weapons and other tools of terror out of terrorists’ hands by allowing the FBI to stop gun sales to suspected terrorists, enacting comprehensive background checks, and keeping military-style assault weapons off our streets. Supporting law enforcement to build trustful and strong relationships with American Muslim communities. Launch our country’s boldest investments in infrastructure since the construction of our interstate highway system in the 1950s. Advance our commitment to research and technology in order to create the industries and jobs of the future. Establish the U.S. as the clean energy superpower of the world, with half a billion solar panels installed by the end of her first term and enough clean, renewable energy to power every home in America within 10 years of her taking office. Strengthen American manufacturing with a $10 billion “Make it in America” plan. Cut red tape, provide tax relief and expand access to capital for small businesses. Ensure that caregiving and related services are good-paying jobs, recognizing their fundamental contributions to families and to America. Pursue smarter, fairer, tougher trade policies that put U.S. job creation first and get tough on nations like China that seek to prosper at the expense of our workers. This includes opposing trade deals like the Trans-Pacific Partnership. Commit to a full-employment, full-potential economy and break down barriers so that growth, jobs and prosperity are shared in every community in America. There’s more, actually. Let’s make it three. In just over a month, we will cast our votes for president of the United States. The Republican and Democratic candidates are high-profile and well-known, at least by name. The Libertarian candidate is a distant third, but has enough voter interest to be included here, even if he didn’t have enough in the polls for the first debate this fall. In January I profiled 15 presidential hopefuls, 12 Republican and three Democratic, before the primary season began. I quoted each candidate on the issues from his or her own campaign website. Hillary Clinton, the Democratic nominee, served as the 67th U.S. secretary of state from 2009 to 2013, U.S. senator representing New York from 2001 to 2009, first lady during the presidency of husband Bill Clinton from 1993 to 2001, and first lady of Arkansas during his governorship from 1979 to 1981 and from 1983 to 1992. Her vice presidential running mate, Tim Kaine, is an attorney and U.S. senator from Virginia since 2012. Donald Trump, the Republican nominee, is a businessman, television personality and chairman of the Trump Organization, which is the principal holding company for his real estate ventures and other business interests. His vice presidential running mate, Mike Pence, is an attorney and the 50th governor of Indiana. Gary Johnson, the Libertarian nominee, is a businessman, author and was the 29th governor of New Mexico from 1995 to 2003 as a member of the Republican Party. His vice presidential running mate, William Weld, is an attorney, businessman and served as the 68th governor of Massachusetts from 1991 to 1997 as a member of the Republican Party. Between the sound bites, attack advertisements, debate mudslinging and low popularity in nearly all polls, it’s hard to know exactly where Trump and Clinton stand on most issues. Sure, they are loud on a couple of positions passionate to each. When we take the emotion out of this election, what are they standing on? What specific plans do they have to solve the nation’s problems? It’s hard to hear those details amid the rhetoric. As I did in January, I visited the campaign websites of Clinton and Trump, and also Johnson this time. I edited their position statements for clarity. I also removed the digs against their opponents. Don’t degrade your opponent(s); tell me how you will solve the problem. Don’t preach. Give us your plan. Each describes his or her plan in his or her own words, choosing the issues important to him or her. Seeing what their priorities are is a position statement in itself. Rather than both candidates speaking on the same issues, as happens in a debate, the candidates on their websites choose their issues and their positions. Let’s hear it. I illustrated this introductory blog with yard signs I’ve seen from all three candidates. I’ve seen Trump-Pence signs for months, many still standing from the crowded GOP primary season last winter. I’ve only in the past week seen Clinton-Kaine signs in the ground, and I’ve seen one or two Johnson-Weld signs as well. All three candidates prefer white lettering on blue background. Not very original. Unlike the candidates, not very different. I’ll post the statements of Clinton on Wednesday, Johnson on Thursday and Trump on Friday (in alphabetical order). If you don’t know who you’re voting for – or even if you do – do you know where your favorite candidate stands on multiple issues? 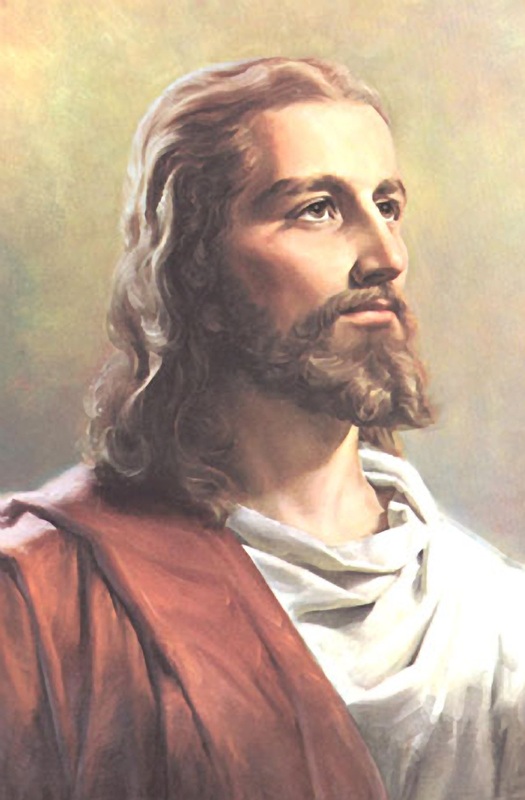 See you at the polls on Nov. 8.
Who is Jesus Christ, really? Everyone has an opinion about him. He lived, he didn’t live, he died, he was resurrected, he did not get resurrected. He was a good guy. He was a liar. He was the promised Messiah. Our pastor just preached an excellent (although long) sermon on this topic. It matters what we think on this issue. As our pastor said, Jesus is the most polarizing figure who ever lived. And our answer is literally a decision of life and death. Jesus’ message was (and still is) love. He wants the best for us. He wants us to care for each other. What’s so controversial about that? Love has limitations. We can do whatever we want, but that doesn’t mean everything is good for us. That’s where we often disagree with Jesus. Who does Jesus think he is that he can tell us what to do, or not to do? Let me explain the two photos I chose to illustrate this blog. The one on the left is typical of Jesus photos you’ll see. He is calm, compassionate, loving, gentle, beautiful, patient, kind … yes, Jesus was all those things. But that Jesus wasn’t crucified. 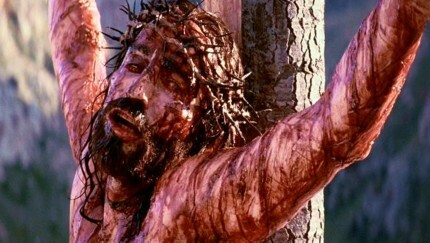 The other photo, from the 2004 movie The Passion of the Christ, shows Jesus being crucified. We don’t like this Jesus because it represents confrontation, loss, torture, suffering and death. Both of these photos represent the real Jesus. To grasp who he really was (and is), we need to understand both photos. The Ten Commandments are written as a list of “don’t do this” – don’t put other gods before the one true God, don’t commit murder, don’t commit adultery, don’t covet, etc. Why the limitations? Because God knows these things will hurt us. Our experiences prove this correct. When we commit adultery, relationships die. When we covet what someone else has, people get hurt. Sometimes literally. Where’s the good in that? When talking about murder, look at Chicago. Yet, why can’t we stop doing it? My life revolves around me. No one else. That’s the way each of us is wired. Love is a choice. It’s not automatic. There’s a huge battle going on inside each of us. Good vs. evil. Love vs. hate. Me vs. you. God vs. Satan, if you will. If my way clashes with your way, my way is right. We may not say that in so many words, but we live that way. Which side do I choose? Tomorrow, I will have to make the same choice again. It’s a never-ending battle. Looking at the struggle this way, how can we ever get it right? How can we ever choose love, and choose it – with its freeing limitations – over and over? That’s where Jesus Christ comes in. People who say he’s a good guy, a prophet perhaps, miss the point. They believe that’s all he is. Just a man who healed people and did a lot of good deeds. He did do those things. But he did more than that. He healed people because he truly cares about our needs. Why? Because his Father does, and Jesus was introducing us to a personal God who loves us. Who wants the best for us. As parents, we have to put limits on our children sometimes. Don’t cross the busy street. Share your toys. Listen to your teacher. Eat your veggies. But we get upset when God tries to put limitations on us, such as the Ten Commandments. We’re adults, after all. We can make our own decisions. Jesus was not saying that only children can become Christians. He was implying that, like children, our hearts need to be willing to learn new things, try new ideas, to realize that other people might have a better idea, that God might actually be right. We focus on politics. Taxes. Road construction. Vacations. Cute family photos. Whether it will rain this weekend. Global warming (ie, how hot it’s been this summer). Of course there is. All of us will die one day. That’s a guarantee. We don’t prepare for it very well. It hurts deeply when a loved one dies. Perhaps that’s why we avoid the subject until we are forced to face it. But why wait until death, or near death, to discover what life is really all about? It’s because of those limitations, isn’t it? We don’t like being told what to do. We won’t admit that right and wrong even exist, because that means we might be wrong sometimes. Jesus is very clear that right and wrong do exist. For our own benefit. But Jesus picks far fewer battles than we think he does. Jesus honestly does not care who becomes our next president, for example. In Biblical times, Rome ruled Israel with an iron fist. The Jews were oppressed. They weren’t looking for a spiritual Messiah to get them to heaven; they were looking for a political Messiah to rescue them from Rome. Jesus refused to play that game. He talked a lot about the kingdom of God, and very little about the Roman empire. Jesus saw a bigger picture. The United States is one of hundreds of countries in the world. Our next president will lead for only four years, maybe eight. He or she will make decisions that last longer than that, certainly, but there are checks and balances in our system of government. There’s a spiritual battle going on here. We can’t physically see it, so many of us pretend it doesn’t matter, or doesn’t exist. Even demons know who Jesus is (James 2:19). Most of us believe in angels. We love the idea of a heavenly being looking out for us. Why, then, are demons so hard to accept? Demons are nothing more than angels who have rejected God’s authority. The war between angels and demons takes place in the hearts of men and women, boys and girls. Every single one of us. Across the world. Across time – past, present and future. That’s not a political question. It’s a spiritual one. Your answer will affect how you live today. In eternity forever, yes, but also today. Here on Earth. No one else can answer this question for you. Or me. Others can give you advice, but the choice is yours.